Eva Surpeme Nail Lacquer? Who are you? This is a brand I've found only at Walgreens, and I'm pretty sure it's only in Florida? I don't think it's everywhere in Florida either? I can find absolutely NOTHING on this company online. The only thing I see on the bottle besides the brand name and ingredients is Miami, FL. That is my only clue...that gets me absolutely no where. This brand seems to change out its selection of colors seasonally. I see new ones every few months or so. A majority of their colors are pretty standard non-interesting colors, but occasionally they have real winner. The polish I have for you today is a definite winner! #185 is bright blue violet with an intense pink shimmer. Win! This is insanely beautiful. The shimmer in this is not shy. It pops! The only sucky thing is why does this not have a name? #185 is not a deserving name for this. 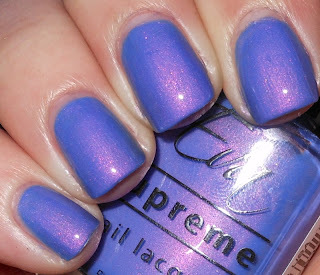 Eva Supreme used to name their polishes, but now they all just have numbers. Lame. Besides, that it's absolutely beautiful. I will say these polishes are not Big 3 Free. I can see that from the ingredients, and I can tell by the smell. That doesn't really bother me, so I'm happy climb aboard the purple-y pink shimmer goodness ship. OMG! NEEEEED! This is gorgeous! Holy crap, so gorgeous! I love me some shimmer!! I love this! I think the pink reflect in it is so cool. :) Almost reminds me of the old hypercolor shirts lol. That is lovely! I'm the Tampa area and haven't ever seen them in my Walgreens. I'm with you, I think it may be a part of Florida thing. Hopefully the rest of the state will get these soon. oo wow this is insanely pretty!! Ohmygosh. That is an absolutely gorgeous color. Holy crow, this is amazing!!! I love shimmer polishes, this one is right up my alley. So perfect for spring! It kind of reminds me of one of the CVS-exclusive Kardashian NOPI's (the name escapes me right now) but waaaaay better. Love it! Booooo!!!! I've never seen this brand in N. Florida. It is gorgeous on you!!! absolutely beautiful color <3 <3 i love it! Wow, that color is gorgeous! This is gorgeous! To bad I am so far away from FL. Thanks for the contest and for NOT putting in all the point things that ONLY work if you have your own blog! This is a beauty - agree with you on that one. I am in Calif and don't recognize this brand at all. But then many of the 'normal' brands don't make it to my area. This is gorgeous! I'm from MT so I know we definitely don't have this brand but I would love to know more about it if you ever find any more info out about it. Thx for giveaway. I would be totally pumped if I won. WOW. This is GORGEOUS! Reminds me of Heaven Nail Lacquer. I only found it at Albertson's here in South Louisiana, but omg they had some AMAZING colors! Unfortunately, last I saw my local store has seriously shrunk their selection. I'm sad about that! I am seriously drooling over this color right now! This is gorgeous-- and totally deserves a name, not a number! I don't think this brand is available anywhere near me, otherwise I would run out and grab a bottle this very minute! That shimmer?! Yeah. Definitely a win. Love it. It had me as soon as I saw that shimmer. Gorgeous!